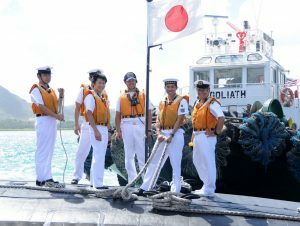 Japan Maritime Self-Defense Force visits Guam. By U.S. Pacific Command. Prime Minister Abe announced on May 3 that he intends to revise Japan’s constitution by 2020 to make the status of the country’s Self-Defense Forces “explicit.” For the past 70 years, Japan has, in fact, maintained military forces for self-defense despite the seemingly straightforward declaration in Article 9 of its constitution that “land, sea, and air forces, as well as other war potential, will never be maintained.” The legal contortions Japan has gone through to field its now formidable SDF have impeded the country’s development as a mature democracy and its ability to protect its own interests. An amendment to Japan’s constitution to provide a legal basis for the SDF is thus long overdue. The Japan Self Defense Forces have a 70-year record of democratic performance. The officer corps has followed government political and operational guidance faithfully, and has earned the trust and respect of the Japanese people, as documented in numerous opinion surveys. However, revising the post-war constitution—a daunting political task since it has never taken place—is only one component of a set of measures Japan should adopt to ensure that the SDF plays an appropriate role in setting Japan’s security policy, continues to be trusted by the Japanese people, and remains under the control of the elected government. Japan has already taken several important steps, including the establishment of a national security council, the publication of a national security strategy, and legislation clarifying the country’s constitutional reinterpretation permitting it to exercise its right to collective self-defense. However, two other important actions should be taken. First, the Government of Japan should clarify the country’s civil-military relations, placing them on firmer legal and procedural grounds. Healthy civil military relations both ensure that military forces are responsive to the democratically elected government and give them the responsibility to provide sound military advice to elected policy makers. Civil-military relations in democracies generally leave the responsibility for policy formulation to elected officials and their staffs, and the responsibility for directing military operations to uniformed senior officers and their staffs. These and many other functions need clearer delineation in the Japanese system. Unelected civil servants in the internal bureau of the ministry of defense currently dominate planning, operations, procurement, and other key defense processes. Many procedures remain unwritten or little understood, and the minister of defense has few officials he or she can appoint to direct the overall operation of the ministry. The MOD should issue unambiguous directives establishing and assigning appropriate functions within the ministry, as well as with other ministries and the prime minister and his staff. Japan needs a less politically-influential GSDF, one that is smaller, nimbler, and more flexible. Second, the roles and missions of the three services within the Self-Defense Forces—ground, air, and maritime—need reassessment. The Ground Self-Defense Forces (GSDF) have remained the most influential service since the start of the Cold War when they served as a strategic counterbalance to an invasion by the Soviet Union’s ground forces. Yet from any objective point of view, invasion is now highly improbable, and Japan’s greatest current and future security challenges will come from the air and sea. Despite some modest adjustments in recent years, however, the GSDF still maintains an outsized regional structure for defeating an invasion of Japan. That geographical spread translates into broad political representation yielding greater influence than the other services, as well as greater resistance to change. Simply put, Japan needs a less politically-influential GSDF, one that is smaller, nimbler, and more flexible. While these two steps are important under any circumstances, they would also give the Japanese people greater confidence that, in approving an amendment to the constitution acknowledging the reality of the SDF’s existence, they will not somehow have encouraged a revival of militarism. Many of us who are friends of Japan believe that the Self-Defense Forces should play a more important role in providing for collective self-defense regionally and globally. Doing so will require much more than simply changing one article of Japan’s constitution.